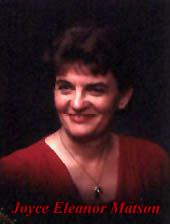 My name is Timothy Paul Matson, and I have created this Website in honor of my mother, Joyce Matson. My mother was diagnosed with a primary brain tumor, grade III on January 26, 2000. Later on the diagnosis was questioned as a total of five tumors developed. Our Radiation Oncologist stated that it was behaving as a Glioblastoma IV rather than a Astrocytoma III. In February, she went in for a biopsy to determine what type of tumor she had. Something went wrong during the biopsy that left her paralyzed on her right side. She walked into the Hospital but left in a wheel chair. We had hoped the paralysis would be temporary but she remained paralyzed on her right side and could not move her right leg or right arm. Her tumors were inoperable due to the fact that they were located deep in the Thalamus area of the brain. Her prognosis was 3 to 6 months. Over the next 3 months, my mother received 38 rounds of radiation, underwent 1 Gamma Knife treatment & was put on the oral Chemotherapy, Hydroxyurea. As we would later find out, these treatments were not effective in slowing down the growth of the tumors in any form or fashion. In May(about 5 months after diagnosis), she experienced an episode of projectile vomiting and was taken to San Diego Hospice were the Doctors told us to prepare for the end. We had lost all hope. It was at this time a friend of the family introduced us to Poly MVA. Like most people, we were skeptical but we couldn't give up searching for hope. We contacted Dr. Al Sanchez(The CEO of the Advanced Medicine Information & Education Center) who provided us with literature containing Clinical research on Poly MVA along with phone numbers of other families using Poly MVA. He also encouraged us not to order the product until we had taken the information to our Oncologist. The families we talked to were very positive about the results they were receiving and our Oncologist said the Poly only contained Natural Ingredients so it wouldn't hurt to try. My mom started on Poly-MVA on June 10, 2000. On her 4th day on Poly, she was able to move both her right arm and leg for the first time since her biopsy. We were ecstatic!! We didn't know what this meant but for the first time in a long time we had something that none of us can live without. HOPE! Over the next several months each MRI showed decrease in Tumor Mass and a decrease in edema. We believed that through prayers along with Gods blessing, my mother would beat this monster called Glioblastoma Multiforme IV. However, in early November we met with the Radiation Oncologist to look at her most recent MRI. The Doctor started off by showing us the area where the 4 tumors had been located. I say, "had been located", because they were gone. He said that all that was left was necrosis(dead tissue). But unfortunately he was not finished. A suspect area in the Brain Stem, that he had pointed out as something to watch in the previous MRI, had grown in size. He told us, due to the location in the Brain Stem and the size it had grown since the last MRI, my mother had less than a month to live. She passed away at home surrounded by her Husband and her 5 Children 19 days later. After a ten month battle we lost her on November 26, 2000. The prognosis had been that we would lose her in May. We believe that although the Poly did not save her life it gave us six additional months. Our Hospice nurses stated that they believed it had lengthened and given her a much better quality of life than they normally see with their other brain tumor patients. They have encouraged us to continue our work with Poly-MVA due to the results they witnessed. At the San Diego Hospice, my mom was referred to as the Miracle Lady due to the fact she left there two times each time with the diagnosis of only days to live. We ask the question, why didn't Poly save her life when she improved so much and four of the tumors were destroyed? In answer, she was on a very high level of Decadron for eight months. This reached 48mg. Research indicates that high levels of steroid use for prolonged periods can stimulate new tumor growth due to the fact that steroids suppress immune function.. This steroid (Decadron-Dexamethasone) is the same steroid given to organ transplant patients(Liver, Lung, Heart etc) once they have received someone else's organ. Why do Hospitals give this steroid to organ transplant patients? Because this steroid is known to eliminate the patients immune function so that the patient's immune system will not reject the new organ. 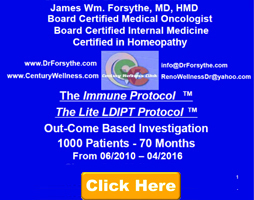 If our medical community knows that this steroid eliminates the patients immune function for organ transplant patients, why are they giving the same steroid to Cancer Patients ? Every time we tried to lower the dosage she would experience Grand Mal seizures due to the brain swelling caused by the trauma from all of her 38 rounds of radiation treatment. We were caught in a catch twenty-two. Once her brain had been pummeled by 38 rounds of radiation, there was no going back. WE HAD TO CONTINUE TO GIVE HER THE STEROIDS or she would die from the brain swelling. On the other hand, the Steroids had eliminated her immune system completely and she had nothing left to fight the cancer. We were never warned of the dangers. The reports from previous patients had indicated that Poly-MVA was not as effective when very high levels of Decadron were in use so we are fortunate that she responded to the level she did. We want other cancer patients to have the opportunity to read about the positive experiences that people have had with Poly-MVA and to share critical information that will inform and protect new cancer patients from making the mistakes we have made. We were not able to save my mothers life BECAUSE WE JUST DIDN'T KNOW ANY BETTER but we have found great joy in sharing what we have learned so that others will not go down the same path that millions and millions of Americans like my mother have gone down. We know and have found that information brings knowledge, and knowledge is power. 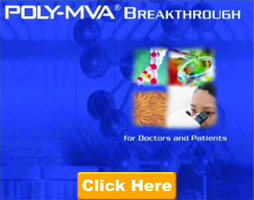 It is our mission to share information about this scientifically based product, (see How Poly MVA works & What you must know) so that others may benefit from it also. I would personally like to thank all of the Cancer Patients who have shared their own personal stories. Their courage has been inspirational to say the least. Their willingness to give back to other CANCER PATIENTS and THEIR FAMILIES who are desperately looking for REAL HOPE, is what true giving is all about!